Seventeen stories of monsters more unique than vampires: ghosts and gorgons and shapeshifters, hidden in plain sight on the fringes of the mundane and urban. Each story appears in Bloodstones for the first time, making it welcome exposure to new fiction (and writers, most of them female!) that unfortunately falls into the pitfall of purpose-written stories: transparency and redundancy. About half the stories walk a single path: Wikipedia-based research, a culturally-appropriative monster and a white protagonist and/or setting, a suburban plot, and a final reveal that the protagonist, not the mythological creature, is the "real" monster. Each story ends with an afterword which, more than redundant, is actively harmful, highlighting its ad hoc roots. The effect is formulaic but the potential of the premise is there--and 100 pages in with Anderton's original and finely detailed "Sanaa's Army" the collection takes an upswing; Maric's "Embracing the Invisible" has a strong sense of place which plays well off its fantastic elements, Rabart's "The Bone Plate" has a powerful and grizzled voice, and Gunn's "The Skin of the World" is a somewhat stilted but resonant end to the collection. It takes more than a unique monster to make a unique story, and some of these have that--but too few do, making Bloodstones middling on the whole: readable, in some ways a refreshing twist on urban fantasy, but also a squandered opportunity. I enjoyed some of the offerings but don't recommend the collection on the whole. I can't comment on a bunch of individual stories, since they're eligible for the Aurealis Awards and I am a judge. And another caveat: I have a story in this one! My general comments are for the rest of the stories in the anthology.Hands down, one of the best anthologies I have read in latter years. So much good writing (and I don't doubt amazing editing - Amanda Pillar is an incredible editor who works extremely hard at getting every last shiny facet out of a story), with a mix of some really unusual mythologies inspiring some utterly unforgettable stories.If you like mythology as a basis for fiction, even if you normally shy away from horror, you should read this. Now. Caveat: I have a story in this collection. But aside from that, this is s brilliant anthology of short horror fiction. It truly stretches the boundaries of the horror tropes, playing all kinds of myths and legends in all kinds of setting. A first class anthology of which I'm very proud to be a part. 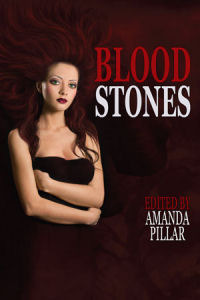 For those of you who are familiar with Amanda Pillar’s work on anthologies, it will come as no surprise that she has done it again and produced an anthology well worth your time. BLOODSTONES (Ticonderoga Publications, Nov 2012) is an anthology of unusual monsters in both familiar and unfamiliar places. Shunning the familiar vampires, werewolves, and zombies, the BLOODSTONES anthology looks to the ignored monsters—the toyol, the gorgon, the foam born—for its stories of survival, love, and revenge. Not every story knocks it out of the park but every story is intriguing in a way that sinks its claws in and doesn’t let go. When I made my list of standout stories, I listed half of the anthology. Cutting them down to the top three was difficult work.My top three standouts are: “Euryale” by Nicole Murphy in which one of Medusa’s sisters must teach one of her progeny a very hard lesson about living with humans. The next is “Smoke Gets in Your Eyes” by MD Curelas in which a bean-sidhe’s need for belief leads her to kill to create a new believer. The third is “Sanaa’s Army” by Joanne Anderton in which a shaman teaches us all that bones are love. These three stories are the ones that stuck with me long after I closed the book. Especially “Sanaa’s Army.” I can’t tell you why. Each of these stories struck a personal chord within me and that, I believe, is the strength of BLOODSTONES. Each story has a personal touch that allows the reader to identify with the monster’s tale. From experience, I know that Amanda Pillar takes each story in her anthologies and runs it through the editorial wringer until it is as good as she can make it. That care and attention to detail shows in this anthology as well. BLOODSTONES is a nice mix of emotion and the macabre and is a lovely, chilling read. Buy this anthology. You won’t regret it. Katharine is a judge for the Aurealis Awards. This review is the personal opinion of Katharine herself, and does not necessarily reflect the opinion of any judging panel, the judging coordinator or the Aurealis Awards management team. To be safe, I won't be recording my review here until after the AA are over. A really solid anthology. Proves that good urban fantasy needn't have a single vampire, werewolf or zombie. Unsurprisingly, some stories appealed to my specific tastes more than others but all were interesting and well written. Well worth a read! Standard Ticonderoga Disclaimer: We published this book because we loved it! Amanda Pillar M.L.D. Curelas Penny Love Karin Maric Christine Morgan Nicole Murphy Jessica Otis Dan Rabarts - Amanda Pillar is an USA Today Bestselling author and editor who lives in Australia, with her husband and two cats, Saxon and Lilith.Amanda has had numerous short stories published and has co-edited the fiction anthologies Voices (2008), Grants Pass (2009), The Phantom Queen Awakes (2010), Scenes from the Second Storey (2010), Ishtar (2011) and Damnation and Dames (2012). Her first solo anthology was published by Ticonderoga Publications, titled Bloodstones (2012), with the Aurealis award-winning sequel, Bloodlines' published in 2015. Amanda is also the author of the Graced series, the Tangled Threads series, and the co-author of the Moonlit Hills series. In her day job, she is an archaeologist.